So tell me friends, how often do you vacuum? I’m convinced that most people do it once a week and Mike thinks it’s an every-two-weeks sort of thing. Be honest, because inquiring minds want to know! I’m actually kind of obsessed with vacuuming and vacuums. I have two, one for a light vacuum and one for a more deeper clean. And, I also have a vacuum crush, which is kind of silly, but it happens to be the cutest vacuum of all time. Anyway, vacuuming has nothing to do with this post, which is actually about miso hummus with crispy onion furikake! Hummus is definitely a goto for me. I have it as a snack and sometimes, I’ll just eat hummus and call it a meal. Why not: chickpeas are high in protein and fiber and low in fat. And they happen to be mega affordable too. To me, it’s amazing that you can take something like dried chickpeas and make the most creamy, smooth, addictive dip. It’s been cold and blustery here and hummus is probably not what you’re craving right now, but hummus reminds me of summertime patio vibes, the sun gently warming my back, a frosty glass in hand, and crunchy crispy things to use a shovel for sunshiny, savory hummus. 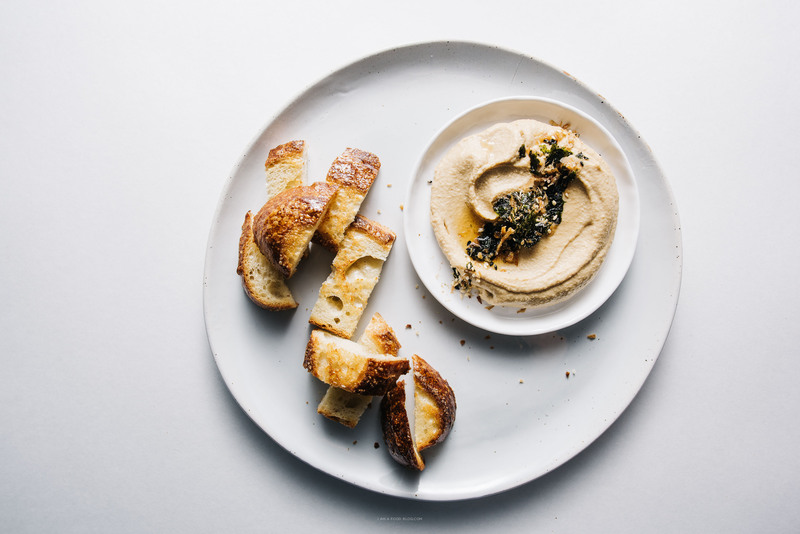 If you haven’t made hummus before, you should definitely give it a go because you’ll feel like an absolute kitchen genius. 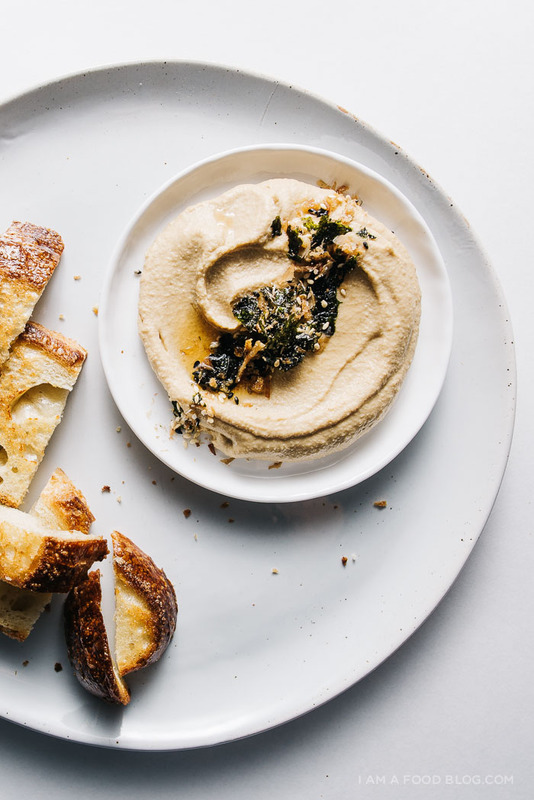 This hummus whips up like a dream. Speaking of dreamy things, the UN has declared 2016 the International Year of Pulses. Pulses, in case you didn’t know, are all the lovely edible seeds of plants in the legume family. Pulses include things like: chickpeas, lentils, dried peas, and beans and they totally fit into my idea of what dreamy food is. I have a thing for texture, and the texture of properly cooked pulses is one of the things that I absolute love. 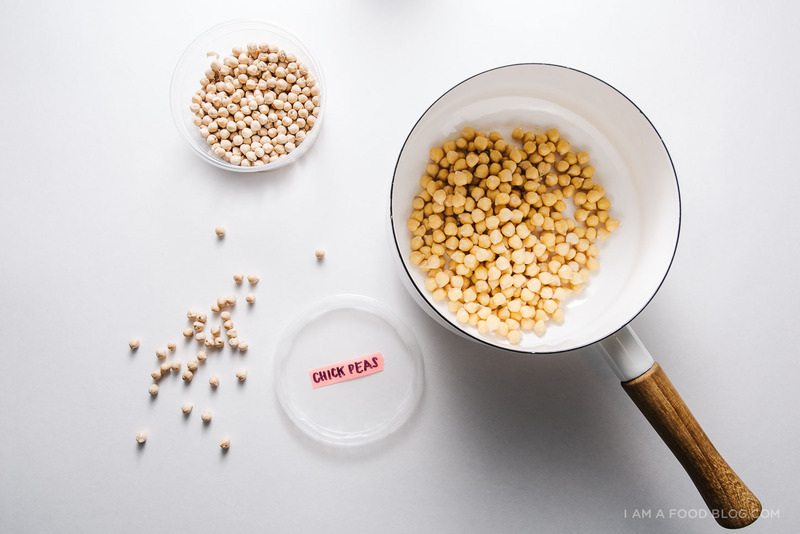 Pulses are definitely a staple in my pantry (right now I have adzuki beans, chickpeas, split peas, great Northern beans, and mung bean threads) and as part of the International Year of Pulses I hope you take the Pulse Pledge with me! PS – I couldn’t resist topping this hummus with some crispy onion furikake, but it’s completely optional; I think it tastes just as good without. PPS – I’ve got my eye on these two fun pulse recipes floating around right now: warm chickpea salad and creamy French lentils. 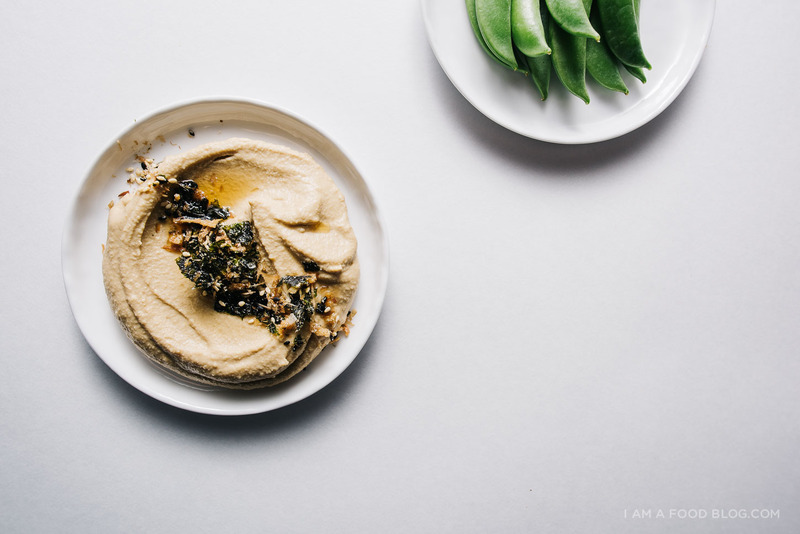 This particular hummus is super smooth and seasoned with one of my favorite ingredients, white miso. 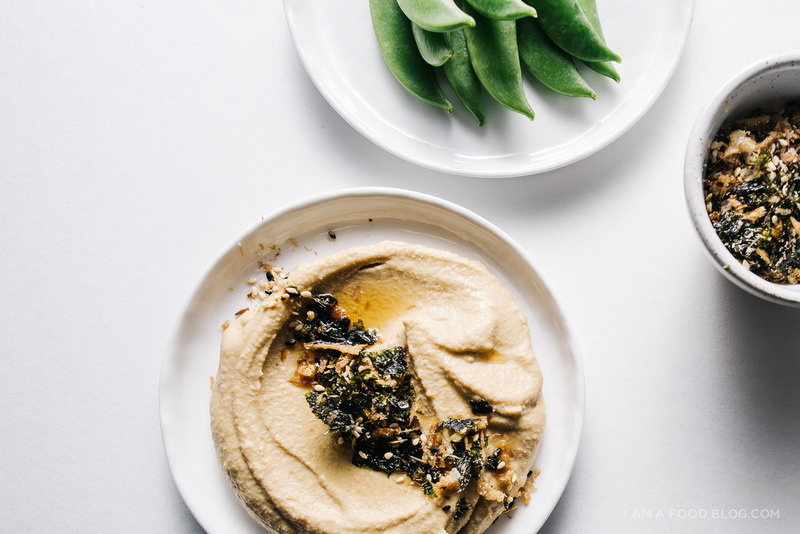 Umami forward miso gives this hummus a deep richness which is offset by lemon. I swapped out traditional tahini for Chinese sesame paste, which adds even more depth of flavor due to the fact that tahini is made with un-toasted sesame seeds and Chinese sesame paste is made with toasted. The result is a ultra-nutty, yet fluffy hummus, totally the hummus dreams are made of. Place chickpeas and 1/2 teaspoon baking soda in a medium bowl and add cold water to cover by 2 inches. Cover and let sit, at room temperature overnight, until chickpeas have doubled in size. Drain and rinse. In a large saucepan, combine the soaked chickpeas and remaining 1/2 teaspoon baking soda and add cold water to cover by at least 2 inches. Bring to a boil, skimming if needed. Reduce the heat to medium-low, partially cover, and simmer until chickpeas are tender and squish easily between your fingers, about 45–60 minutes. Drain and set aside. While the chickpeas are cooking, place the garlic, lemon juice, sesame paste, and miso in a blender or food processor and pulse until smooth. With the motor running, Add the ice water, 1 tablespoon at a time (it may seize up at first) until mixture is very smooth, pale, and thick. Add the drained chickpeas and cumin and process, scraping down the sides as needed, until very smooth, about 4 minutes. Thin with water if a looser consistency is needed. Taste and season with lemon juice, and cumin, as desired. 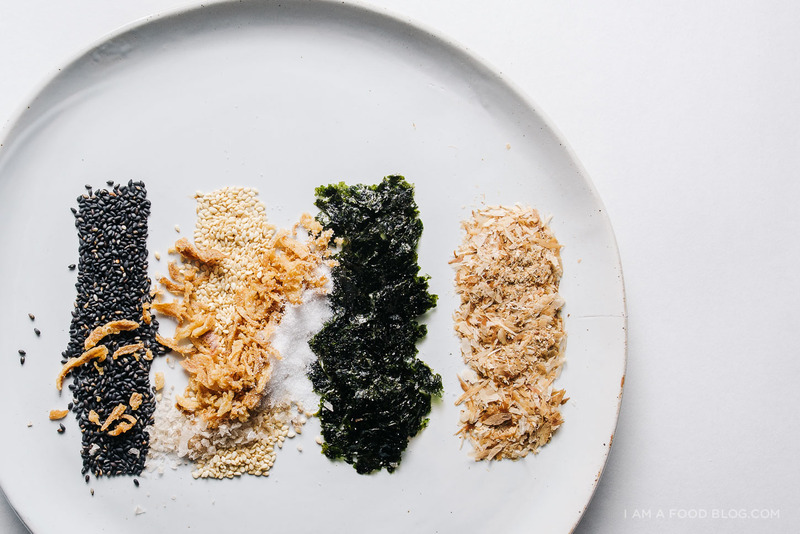 Because you’re topping with furikake, resist the desire to over season with salt or extra miso. 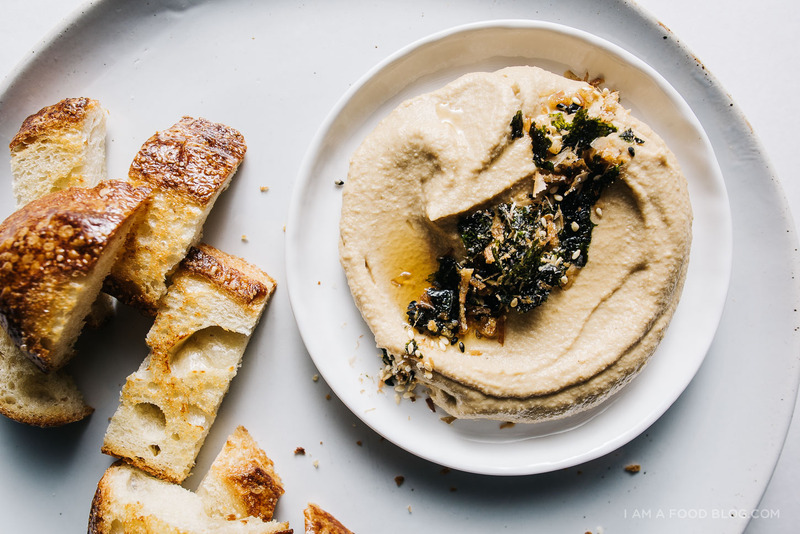 Scoop hummus into a shallow bowl and drizzle liberally with olive or toasted sesame oil. Top with a sprinkling of furikake. Enjoy with lots of crispy things to scoop up, or just with a spoon. Mix all of the ingredients together. Use as a finishing salt/seasoning. Sprinkle onto hummus or other things that need a bit of jazzing up. i refuse to make that crispy onion furikake. i have a feeling once i start, i’m never going to be able to stop (crispy onions and bonito sound heavenly together~). I need to vacuum more often…definitely not getting done once a week here. More like once every time we’re about to get visitors. :’) The hummus looks lovely. On my to-make list for 2016! The apartment where my husband and I live right now is all hardwood floors with one big carpet that we vacuum every time that someone is scheduled to come over. I have been looking for a Furikake recipe for the past couple of weeks, and this just looks perfect. YUM! My wife is kind of obsessed with vacuuming too. She does it twice a week, I don’t know why. And I love homemade hummus. I love that you put sesame paste in your hummus recipe, I think it makes the hummus taste nuttier and, in my book, yummier. My mom got me a roomba a few years ago and it totally changed my life. I let roomba do a lap around my apartment every other day and then give myself a pat on the back because I “cleaned”. LOLed at Vacuum V(W)endesday. We vacuum every other week. I decided I can only do one thing per weekend – clean the house, or do laundry – so I switch off. I’d to make both those things weekly, but right now it feels like too much. I’m also loving the Pulses lately. I’m starting to eat a more vegetarian diet and really love the texture and flavors that beans can add in place of meat. Those creamy French lentils look amazing. I was wondering how long the Crispy Onion Furikake will last. Although, I’m sure it will be so delicious we might eat it all anyway. it depends on which crispy onions you use. i used some trader joe’s ones, so they have a pretty long shelf life. all the other items have a super long shelf life too so you should be good. i’d keep it in the fridge if you’re worried or you can make a tiny half batch :D hope that helps! Ahh, vacuuming! I’m in the vacuum every two weeks camp, although with 2 kids running around the house, I think once a week would be better. I have a hard time making it a priority though! 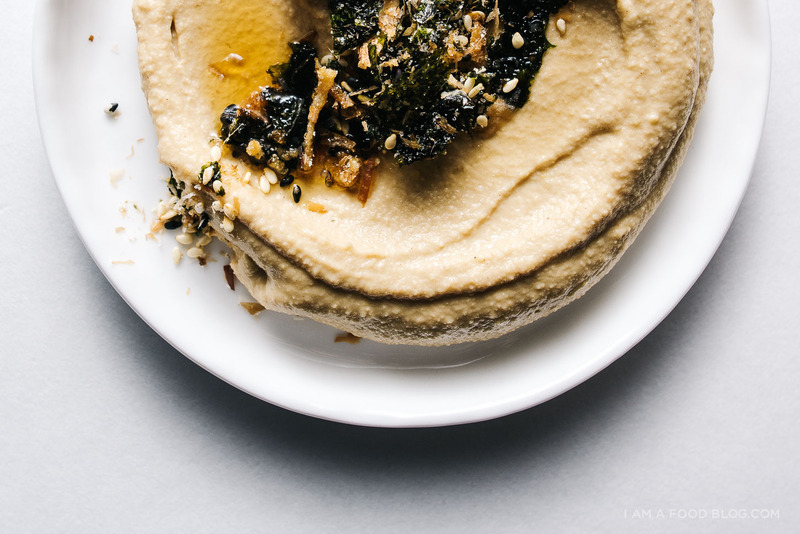 Maybe if I find a super cute vacuum like you… ;) Miso is my latest obsession and I imagine it’s awesome in hummus. Beautiful as always! I feel like my apartment’s floors get easily dirty because every time you go into the courtyard you walk stuff back inside and there’s a rug in the lounge room that seems to get used as a giant doormat :P So I’m probably averaging two times a week at the moment… then again, I don’t know if I’m just really pedantic about it. This hummus looks deeeelicious! This is such a clever spin on hummus! I especially love the sesame paste, that sounds like it would be so so good. And oh my gosh, good for you for vacuuming every week. I hate it so much, I pretty much fall in the ‘vacuum when I’m embarrassed about how dirty it is’ camp. I somehow lived without a vacuum for the longest time and relied on a broom, but getting a vacuum has legitimately changed my life for the better! It’s such a quick way to clean. 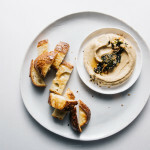 This miso hummus sounds amazing- I can’t wait to try it!! I wanted to make hummus the other day, will try this soon because I love miso! HOOOOOOOOOLY YES PLEASE. This hummus is absolutely exquisite. I cannot wait to make it. With all o’ that crispy sourdough bread, please. Yow!! Oh we totally vacuum twice a week. But we also have a dog…and could probably vacuum every day because of that! I actually made this last night. I skipped the Crispy Onion Furikake. This is my first time making hummus. Needless to say, it is so good! What a clever spin on a classic dish! This is the most genius idea ever EVER, Steph! Miso and the extra toastiness from Chinese sesame paste (!) omg. It sounds meant to be. And these photos are just too beautiful. You never cease to amaze me, lady! I love that you have a day devoted to vacuuming. I think I need to start that in this house. Once or twice a week is supposed to happen here but I’m afraid we’ve (I’ve) been in the Mike camp recently. Regarding this hummus, it’s everything I’d hoped it woud be and more!! Can’t wait to try your recipe!!! I only vacuum once every 2 weeks.